This image shows a 5-pound bag of rose quartz tumbling rough, dumped into a colander and sprayed with water to reveal its full color. Click on the image for a larger view. 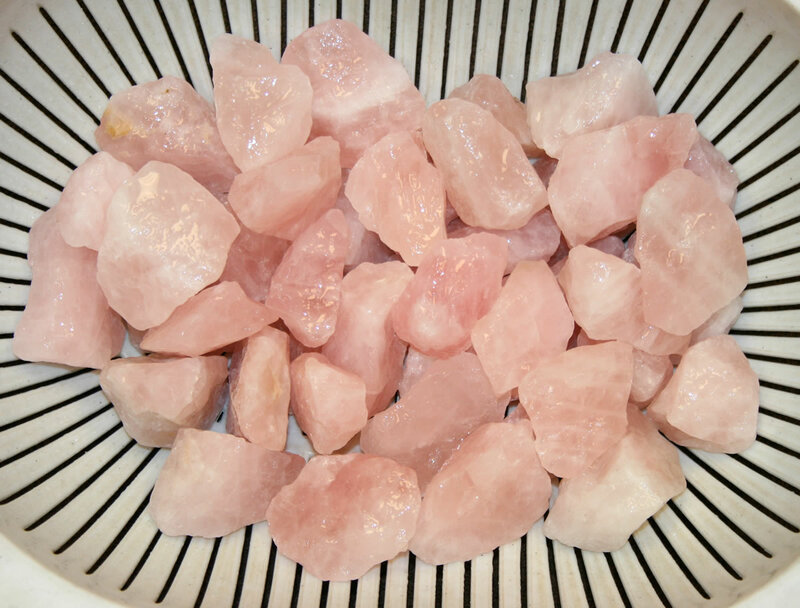 We are offering some beautiful rose quartz with a strong pink color. This material is from South Africa and is being sold in five pound bags. It is a perfect size for making large tumbled stones. You might also slice these pieces into small slabs for cabbing or tumbling with a trim saw or small slab saw. Most of the material in these bags ranges in size between 1 and 3 inches along their maximum dimension. A few pieces might be a bit over or under those sizes. Coarse Grit Step: Fill the barrel 2/3 full with a mix of 20% media and 80% rose quartz. Add two level tablespoons of coarse grit per pound of material and cover the rocks completely with water. Then tumble for two to four weeks - or long enough to shape and smooth the stones. After you are finished tumbling you should have some nicely shaped and polished rose quartz with a rich pink color. If you prefer to purchase your tumbled stones instead of polishing them yourself, we have some nice rose quartz for sale here.